Explore New Zealand through the eyes of a local, with dozens of activity filled vacation packages spanning the North & South Island. Each trip includes car hire, accommodation and day tour options, all tailor-made to your needs. Start searching here. The team at New Zealand Vacations would love to work with you in planning your New Zealand vacation. We will listen with great care to your ideas for New Zealand and help you transform these into the experience of a lifetime. All it takes are these 3 simple steps. Browse our New Zealand itineraries and select the one that interests you. Fill in the form so our team knows about your special vacation needs and interests. We will take your selected itinerary and from it, craft a New Zealand vacation for you to consider, one that is unique to you and your dreams for New Zealand. Our trip was a resounding success—thank you. We thoroughly enjoyed ourselves, even with all the busyness. We enjoyed our time on the North Island, especially Hobbiton and walking around the cities (Auckland and Wellington). The beauty of the South Island is unmatched, in my opinion. We enjoyed Picton, hiking the Queen Charlotte track—stunning scenery. Highlights for us were Marlborough, Queenstown, and Milford Sound kayaking. Full members of ASTA - The American Society of Travel Agents. Virtuoso, The luxury travel network. YTC - 'Your Travel Center'. MVT - Montecito Village Travel. We have special discounted accommodation rates and deals with local tourism operators throughout New Zealand, so you’ll have the most competitive prices and the best advice that money can buy. 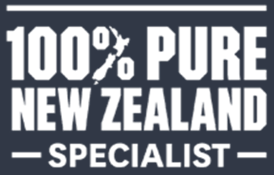 We are New Zealanders, genuine New Zealand travel experts, with years of experience to guide you to those special locations where you'll experience the true essence of our beautiful country.